I spent a couple of days in Providence with brother Lurker W. Here are the places we hit -- as usual, they range from the sublime to the ridiculous. This is the report on Friday night. Minerva Pizza (Wayland Sq.) -- our plan to grab moules at Red Stripe while waiting for our table at La Laiterie fell through because the wait at RS was even longer than at LL, so we popped in to on of my old haunts, Minerva Pizza. New owners took over about 5 years ago, and have cleaned the place up. Still the usual greek pizza. Not nearly as greasy as I remember, and the crust even held up under three toppings -- Mushroom, banana peppers, and linguica (great combo BTW). Good neighborhood pizza. La Laiterie (Wayland Sq.) -- we weren't exactly starving after the pizza, so we shared the charcuterie plate and the mac&cheese. 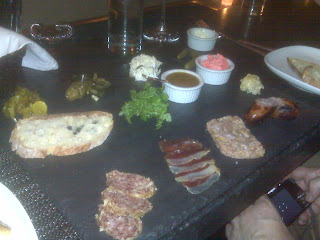 The charcuterie doesn't look like a lot of food, but it's all very intensely flavored. Four meats (some kind of salami, duck carpaccio, pork trotters pate (basically pure fat), and some kind of sausage), four pickle-type things (bread and butter pickles, pickle jalapenos), celery root salad, and cornichons), babu's (sp?) mustard (very intense), red wine butter, and the surprise, honeycomb. Everything but the cornichons is house-made. Really an incredible array of flavors. The honeycomb was the big surprise; didn't think I would like it but it was great. The pate was absurdly rich. The mustard and jalapenos will blow your head off. Etc etc. And the mac cheese? Just ridiculous. This is not food for the faint of heart. (Although your heart might faint after you're done.) This is a place I could be a regular at. We each tried a different red wine. Both were very dry and good accompaniments for the rich food. Bluefin Grille (Providence Marriott): We got coupons for free breakfast brunch (regular price is $15.95). Not bad at all. Marriott bacon is as good as ever. The brunch also includes smoked salmon and good fresh fruit. Lurker W had a nice egg white omelet made to order. You can eat pretty well here. Normally I might not have eaten for the rest of the day, but there was work to be done. Rufful's (Wayland Sq. ): We stopped in as usual, but the torch has been passed. Mike Rufful and his brother in law John have retired. The boss is now Mike's son Peter. Being stuffed from breakfast we just got a grilled corn muffin and coffee. The place is doing just fine, but it's not our Rufful's any more. Mike's Kitchen (Knightsville, Cranston): This place lives up to the billing! Not only is the food very good -- we shared snail salad, fried calamari with hot peppers, veal and peas, polenta, and a side of peppers (now how RI is that menu?) -- but the place is a trip (on many levels). (For comparison's sake, think Rocky & Carlo's in Chalmette, LA). I could go back to Mike's ten times, order five different things each time, and probably be just as happy each time. Chez Pascal (Hope St., Providence): I'm going to give CP a pass, because we were really too stuffed to truly appreciated the place on this visit (surprised, huh?). I got the vegetarian tasting menu, because I was trying to eat somewhat light. Unfortunately, i didn't eat light. The salad came with a square of creamy goat cheese in a crispy shell, and my entree was a puree of something in a crispy shell over some cubed root vegetables with a scoop of pumpkin mousse. The whole thing was just too much. There was a special king crab appetizer but the crab was served over a ragout of some other root vegetables. Just sounded like overkill. The whole fall menu thing...just too heavy and monochromatic for me on this visit, I guess. I don't want to dissuade anyone from trying what is clearly a beloved place. I'd give the place another shot -- on a completely empty stomach. They have a great wine list (I got a half-bottle of a Chataneuf du Pape-style wine from Calif) and some really interesting cocktails too. And sadly, no late-night NY System weiners. Modern Diner (East Ave., Pawtucket): Lurker W was under the weather so I had to venture in by myself. Once again, the Modern hit a home run. The key is ordering one of the specials thumb-tacked or taped to the wall. I got cranberry-apple french toast. 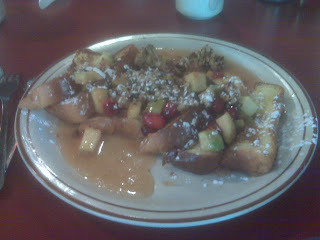 Not only was it delicious, but like the french toast I got on my last visit, it was artistry on a plate. Just a great dish. Seven Stars Bakery (Hope St., Providence): Lurker W got a baguette because that's all his stomach could take. Excellent baguette. Nice and chewy. DeFusco's Bakery (Cranston): We got a bag of pizza strips to take to a tailgate at the Pats game. Love those pizza strips! So cheap yet so good. Finally, I picked up a 32-oz bottle of Autocrat coffee syrup to take back to VA. The TSA guy at the airport got a kick out of that when it showed up on the x-ray machine (in the bag I checked specifically so I could get my coffee syrup home). I went to Back 40 a few days ago with my son. We were promptly seated in the outdoor garden which, compared to other ones, was pretty comfortable. We had risotto balls with beets and blue cheese (not a favorite of my son), the special fennel salad with pumpkin, grass-fed burger with sea salt and rosemary fries and a 1/2 of chicken cooked in their French-made rotisserie (left/sold by the previous restaurant) . If I judged the meal based on how much or how fast my son ate his hamburger, it was a huge success. He finished the whole thing in record time. Despite the food and excellent service, it was a bit pricey for Avenue B in the East Village. But we’ll probably go back (40) again anyway. Last weekend we celebrated my birthday by EatingWells and LivingWells. On the way back from my son’s soccer game in Brooklyn (he won), we were diverted by heavy traffic on the BQE to just under the Brooklyn Bridge. We took the opportunity to have a quick pizza at Grimaldi’s Pizzeria on Old Fulton Street. We shared a large plain pie- just some sauce, basil, olive oil and fresh mozzarella cooked in a coal brick oven until the crust blistered and the bottom has just a touch of black. We enjoyed it lot. We then headed around the corner for some of Jacques Torres Chocolate. We shared apiece of dark chocolate bark with some espresso (my son tasted Torres’s famous hot chocolate). That night, we went to Le Perigord, one the few remaining classic French restaurants. We started with two glasses of Lillet and a Shirley Temple for our apperetif. Next my wife and I ordered the cold buffet and my son chose the escargot. For the plats principaux, we had halibut, bass and a filet of beef. Finally, for dessert, we had a chocolate souffle, chocolate mouse and apple tarte tatin. It was a lot of food and a lot fun and I can’t think of a better way to celebrate my birthday.